Announcement The Splendid Slipper offers ready-made and custom-embellished shoes for fun and fantasy. Let us cobble a pair just for you! This shop is a division of Better Dresses Vintage, a Proud Member of the Vintage Fashion Guild. For news and updates, Like Us on Facebook and join our newsletter at our flagship site: www.BetterDressesVintage.com. 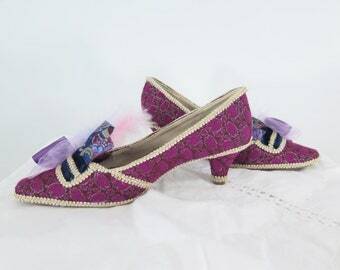 The Splendid Slipper offers ready-made and custom-embellished shoes for fun and fantasy. Let us cobble a pair just for you! These were so comfortable and added the perfect touch to my costume. Thanks so much! Dress is beautiful, in excellent vintage condition and was shipped promptly. Thank you! This is a lovely jacket but too tight in the underarm area for me. (I have a very sore underarm due to radiation, but don't think it would have been a problem if my sensation was normal) Seller was very communicative and gracious about my need to exchange this. It shipped very quickly. Purrl says: "Tell all your friends! Remaining vintage inventory is now just $5, $10, or $20." Shipping will be combined to save you even more money, and overages refunded. Returns for store credit only (good here and at Better Dresses Vintage). The big CLEARANCE EVENT is on! Shop clearance here at Bee Dee Vintage on Etsy, and also at our flagship site (www.betterdressesvintage.com), for deep discounts on a variety of authentic vintage items. You don't need to be in baroque dance troupe to enjoy the gorgeous shoes! Partial view of the BDV studio. A rack of colorful vintage dresses await listing. Cracked Betty, Vera the Hand, Cracked Jane -- our accessories models. Yummy crinolines for filling out those 50s circle skirts! Blue cotton vintage dresses, freshly laundered and drying on the line. At The Splendid Slipper, I offer ready made and custom-cobbled shoes for fun and fantasy, at affordable prices. Let me make a pair just for you. I'm happy to use your favorite colors, patterns and embellishments, and whatever heel height you prefer (including flats). I can make your shoes entirely vegan, or not. It's all up to you! Yes, I'm happy to use your own fabrics or trims (in most cases) to perfectly match your ensemble. Get in touch and we'll work out all the details. The Splendid Slipper is a division of Better Dresses Vintage, a Proud Member of the Vintage Fashion Guild. 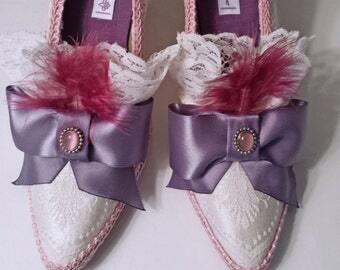 The Splendid Slipper offers ready made and custom-cobbled shoes for fun and fantasy. For authentic vintage clothing and accessories, along with "From My Closet," the BDV blog, visit my flagship site at http://www.betterdressesvintage.com/. The Splendid Slipper offer ready-made and custom-cobbled shoes for fun and fantasy. We love custom orders and will work with you to create something special just for you. Yes, we accept returns on unworn shoes. Custom-cobbled shoes are returnable for exchange or store credit. Unworn ready-made shoes are returnable for exchange or refund. Please contact us with any questions. We stand behind our products. In the unlikely event that we miss something major or send you the wrong item, of course we'll rectify the situation immediately, at our expense. Unworn custom-cobbled shoes are returnable for exchange or store credit only. Unworn ready-made shoes are returnable for exchange or refund, less shipping. If you are unhappy with your purchase for any reason, please get in touch with us immediately. You'll be responsible for return shipping costs. Please ship the unworn shoes back to us within 3 days of receiving them. For custom-cobbled shoes, you'll receive a credit voucher good here at The Splendid Slipper and also at our flagship vintage site: www.BetterDressesVintage.com. For ready-made shoes, you will receive a full refund of the purchase price. All layaway items are final sale, and partial payments are non-refundable. Contact us with any questions or concerns. We accept PayPal and direct credit card payments. You can also pay with your personal check. We will ship your item as soon as the check has cleared. We try to be as accommodating as possible, so contact us if you have any questions or concerns. Yes! We do layaway. Contact us for complete terms. All layaway sales are final, and partial payments are non-refundable. We ship via USPS Priority or First-Class International Mail. Please note that in many cases, the rates we charge do not cover our cost. We ship worldwide, and will honor your request for specific shipping methods or carriers whenever possible. If you have any questions, or want a new quote, please contact us. All shipments are insured against loss, theft, or damage at our expense. If you need something right away, we will do whatever we can to get it to you in time. Please be aware that your country may charge V.A.T. (tax based on the item's value) on merchandise sent from abroad. We will not falsify customs forms. It's illegal. So please don't ask us to do it. 1. WILL THESE SHOES FIT ME? WHAT SIZE SHOULD I BUY? The size listed on ready-made shoes is the size of the original shoe, and they may feel a bit more snug after the cobbling process. We recommend going up one-half to one whole size from your regular shoe size, especially if your feet are a bit wide. Stretching your cobbled shoes may distort or dislodge the decorations. 2. DO YOU HAVE OTHER PHOTOS? CAN YOU SEND ME MORE DETAILS OR MEASUREMENTS? Absolutely. Just ask! We're happy to answer all your questions. 3. I'M LOOKING FOR SOMETHING REALLY SPECIFIC AND I DON'T SEE IT HERE. CAN YOU MAKE IT FOR ME? 4. HOW DELICATE ARE YOUR SHOES? Definitely wearable, but treat them gently. I'd be careful about where you walk in them (avoid gravel, grates, and other damaging surfaces if possible), and you don't want to wear them in the rain, of course. After wearing, stuff them with some clean paper towels or tissue paper overnight, to help keep their shape and absorb any perspiration. Yes. We'll do what we can to find an affordable way of getting your shoes safely to you, wherever you live. All VAT and other import taxes are the buyer's responsibility. 6. CAN YOU TELL ME ABOUT UPCOMING SALES AND SPECIALS? You bet! Go to BetterDressesVintage and sign up for our Newsletter. Or send us your email address and clearly stated permission and we'll do it for you. 7. DO YOU OFFER LAYAWAY? Yes. Contact us for terms and conditions. We're happy to help. We will never share your personal information with anyone for any reason. We do not see your credit card information.